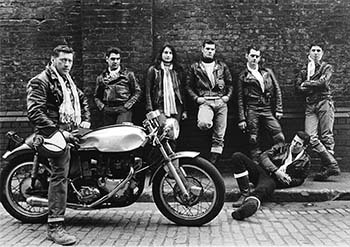 The Café Racer look is forever associated with 1960’s London. The magical engine size was 650cc and long tanks, short seats, clip-ons and loud exhausts were the order of the day. Café Racers (or better “rockers”) wore black studded jackets with drainpipe dark blue jeans and heavy boots. End of story. Folklore surrounding the genre, such as the ‘record racers,’ bikers allegedly racing from one point to another before the record on the juke box finished spinning, are largely urban myths. At the very core of the Café Racer, was the need for rebellious youngsters to cut down the superfluous cycle parts of their daily rides, converting them into stretched out pseudo racers that emulated the look of the TT winners of old. Did they wind on their shaking, rattling, vibrating Beezers, Bonnies, Tritons and Tribsas around the midnight roads of the North Circular, breaking the magical ton before they got to the next café? Damn right, they did. 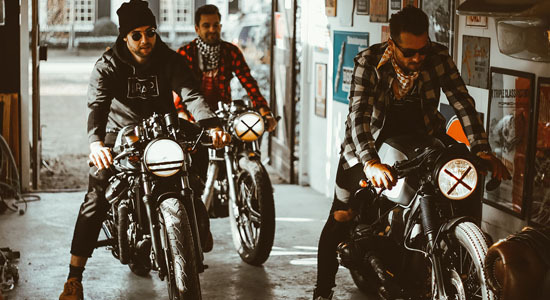 The bikes and their riders were the stuff of legends, so is it any wonder that the look should still be going strong over 50 years later, as a new generation of Café Racer stamp their mark on the genre? So, ok you’ve decided that you’re drawn to this style of bike but need a little inspiration, the first thing to do is some research on the search engine of your choice. Don’t sell yourself short and think this is just copying someone else’s ideas. 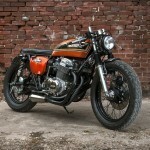 The trick is, to use other Café Racer builds as a springboard for ideas for your own ride. Next, be realistic with your expectations in terms of budget, practicality, and availability, remember you’ve still got to be able to afford it, and ride it. This is also a good time to take a serious look at your own particular motorcycle too. There’s nothing to really stop you from Café Racing anything (just look at the Ducati Scrambler Café Racer!) but obviously, some bikes will be easier to convert than others. Unless you’re going to get the angle grinder and welder out, things like frame design and cycle parts will heavily influence the finished look. Basically speaking, a Café Racer conversion will fall into five areas, namely, tank, seat, handlebars, footrests and exhaust. These are obviously just cosmetic changes but like every aspect of customization, the difference from mild to wild is purely down to the depth of your pockets. Working on a tight budget? 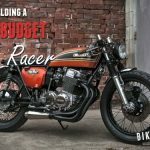 Read my article about a low budget cafe racer first! Round about now, you should be ready to start hunting down the parts, but unlike me when I went through this exact same process for my 1968 T120 Bonnie (this involved wading through the piles of scrap accumulated in friend’s garages and sheds) we now have the internet, so let’s take a good look at just what’s available online in terms of quality, value for money and availability. 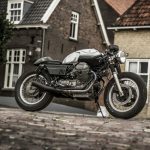 We seem to be well catered for in Western Europe and first up is https://www.ace-caferacerparts.com/. Not to be confused with the Ace Café in London, this online shop is based in the Netherlands. It’s a goldmine of very classy and well-made looking accessories, ranging from classic Ceriani front forks at a whopping 2375 Euro to very reasonable aluminum rear sets starting at 125 Euro. Whilst you’re clicking around on the site check out the seat and tank section. The single seat units look great and are made for universal fit and specific models of BMW. Although they do give dimensions, it would be nice to see a pic of the underneath of the seat to give a better idea of fit. This also goes for the fuel tanks too, although here, the majority do seem to be made to fit a particular model. There is a helpline available after 7.00pm or all day Saturday and their returns policy looks straight forward too. 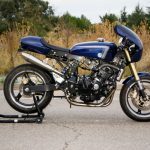 https://caferacerseats.co.uk/ is an online only shop based in Sheffield UK, trading under the name of the Complete Café Racer. As well as making the fiberglass Café Racer parts themselves, owner Tony Garnham-Parks builds some cracking looking bikes using his own parts. Interestingly, they manufacture a range of fiberglass tank covers, which give you a classic shape but fits over a smaller inner tank. Shipping to the UK mainland is free and they do ship to the rest of the world. Feedback from their Facebook page looks positive with plenty of updates and workshop pics of ongoing projects. With a heritage going back to 1978, Burton Bike Bits is one of those dying breeds of old fashioned British bike shops that’s made the successful leap to becoming an online shop, offering a staggering 30,000 parts through www.britishbikebits.com/cafe-racer-parts. Selling just about every engine and frame spare you can imagine for Triumph, BSA, Royal Enfield and Norton as well as Hinckley Triumphs, their range is staggering and website easy to navigate. Once again, they’ve got a Facebook page, so have a look around and check it out for customer feedback and shop updates. Don’t worry that www.kickstartershop.de/ is based in Germany as there’s a row of flags along the top of the front page that translates the site into five languages. It was also nice to see Café Racer parts for a host of Japanese bikes, ranging from a custom seat for your Honda CX500 to bang up to date face lift kits for your Yamaha XV950. Check out, their Kickstarter Blog found at the top of the page, it’s all in German, but there’s some great vids posted. Over the other side of the pond Dime City Cycles www.dimecitycycles.com/ cater for Triumph, all Japanese brands and not just for Café Racers. There’s lots to click around including a gallery of customer bikes which is good for seeing what components look like in situ. 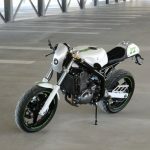 Cognito Moto in Virginia runs a very slick looking site at https://cognitomoto.com/ there’s page after page of seriously cool machined custom Café Racer parts, such as triple clamps that allow you to mount usd GSXR forks onto your BMW. 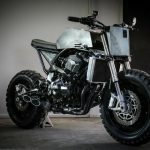 There’s a slide show of their builds as featured on various biker sites on the web and the checkout page says they offer international shipping. 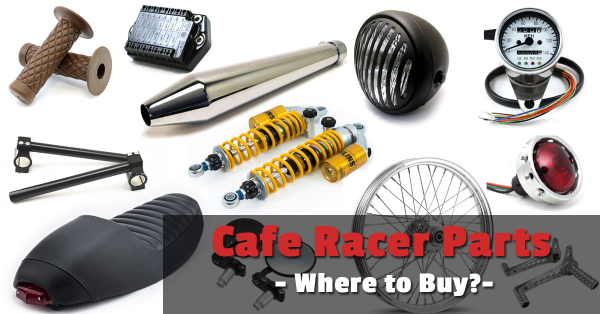 In the market for some Café Racer parts but can’t source them locally, then chances are you’ll be able to order them over the internet. There are however, a few rules to follow if you do. First of all, if it’s an online shop, see if they have a social media presence like a blog or Facebook and check out any feedback they have from previous customers. Something else to look out for is if they update their page regularly, if they do this usually means they’re internet savvy and good with communication. Sooner or later, it’s inevitable that you’ll end up on eBay, even if it’s just for a price comparison. I’ve been down this road myself many times and with a few exceptions, have been satisfied with my purchases. But, and it’s a very obvious but, you know there’s a whole host of badly made tat just waiting for you to hit ‘Buy it now.’ If in doubt move on, or at the very least check out the seller’s feedback, all the info you need to make an informed decision is right there if you look. It’s a great place to buy smaller, less expensive items such handlebar grips, speedos and blinkers. But remember, quality may be an issue. Plus, returns are not always easy, especially when the seller is in China. The same goes when ordering from other sites such as Alibaba.com where, nine times out of ten you have to order in multiples. It’s a sad fact that the internet is teeming with cheap imitations of famous branded items and whereas this used to be mostly aimed at designer handbags and clothing, now the more unscrupulous manufacturers from the Far East will turn their hand to anything and this includes custom bike parts. Done right, Café Racers have the legacy to look seriously cool and are fun to ride so if you get ton-up fever, just do it, but all I will say is this, Caveat Emptor (Buyer Beware). Those ancient Romans may not have known what it was like to take a sweeping bend stretched out over a 5-gallon aluminum tank, but they knew a dodgy deal when they saw one. Gear up and ton up! PS. 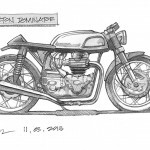 Ready to start building your own cafe racer? Check out this guide! You’re more than welcome Jay! Thanks for listing us! We love helping our customers build their dream Cafe Racer and do the Ton!! Keep up the good work!